Vietnamese Pot Roast Chicken – 370kcals and 23g of fat/ serving. Place the garlic, ginger, chillies, turmeric, lime leaves, coriander, oil, salt and pepper into a food processor and blitz until it becomes a smooth paste. With your hands gently rub under the skin of the chicken to detach it from the carcass then rub the marinade all over the chicken, and underneath the skin of the chicken. You can slash the legs two or three times so that the marinade can permeate into the meat. Leave to marinate for at least two hours but the longer you leave it the better it will taste so I would suggest doing it for the full 24 hours. Heat the oven to 200C. Place the chicken into a deep Dutch oven casserole dish. Cover with the beer, stock, fish sauce and palm sugar, pop the lid on and roast in the oven for 30 minutes. After 30 minutes remove the lid and finish baking with the lid off for another 30-40 minutes or until the chicken is cooked through. Remove from the oven then leave to rest for 15 minutes. Remove the chicken from the pot. There should be about and inch of sauce in the pan. Taste the sauce. It may need to be seasoned. 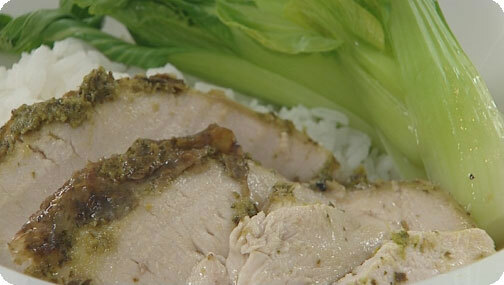 Carve the chicken and serve with boiled rice and pak choi with the sauce poured over.